INDUSTRY.co.id - Jakarta - PT Asuransi Kredit Indonesia (Persero) organizes a "Gathering Broker" with the Association of Insurance and Reinsurance Brokerage Companies of Indonesia (APPARINDO). Activities aimed at improving the synergy between Askrindo with the Brokers raised the theme of welcoming the 2018 business opportunity with Askrindo. President Director of Askrindo, Asmawi Syam conveyed, Askrindo will welcome 2018 with an increase in performance one of which is to take momentum infrastructure development that was intensively conducted by the government in 2017 and 2018. "We have to take that momentum, infrastructure development needs insurance protection, and we will be tracking the momentum.We build the infrastructure is government and state-owned, Askrindo is state-owned so we have to take 'kuenya' as well, not just be audience," Asmawi said at Grand Hyatt Jakarta, Tuesday (19/12). Asmawi describes, several strategies have been done Askrindo, among others, by digitizing. In addition, Askrindo will also open an extensive network by opening cooperation with brokers. "Gathering Broker is also one of Askrindo's strategies to become better next year, here we explain the role of Askrindo regulation to professional brokers, to facilitate to Askrindo," said Asmawi. Director of Commercial Opersional Dwi Agus Sumarsono said, future distribution will be relied upon to a third party broker. "Professional and positive brokers will help us increase premiums in the coming year," he said. 2018 will also be a Askrindo event to become a market leader in one of its products. This is done in the hope of becoming a market leader in the coming 2020 sectors. "We will make the insurance business core become market leader in 2018. Because the insurance will contribute as much as 20-30% to pursue the target premium in 2018," explained Dwi. Meanwhile, Chairman of APPARINDO Harry Purnomo expect, this synergy is done to facilitate cooperation with the Brokers with Askrindo. 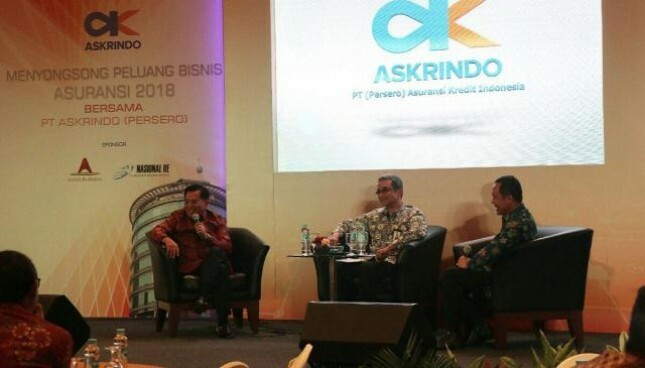 "This is a great opportunity for Brokers to further develop into Askrindo and contribute to Askrindo especially with the new management and regulation will be very easy for us to synergize with Askrindo," he concluded.